In keeping with our tradition for more than 100 years, Federated Charities provides affordable office space to registered 501(c)(3) nonprofit organizations in an accessible, downtown location. Many of the spaces in our building have maintained their historic charm and range in size from 300-5,000 square feet. Our square footage rate is significantly lower than downtown commercial rates and the rental fees include heating, central air conditioning, electricity, water and sewer fees, conference room use and all building maintenance. Leasing is offered on a one-three year basis with annual renewals. 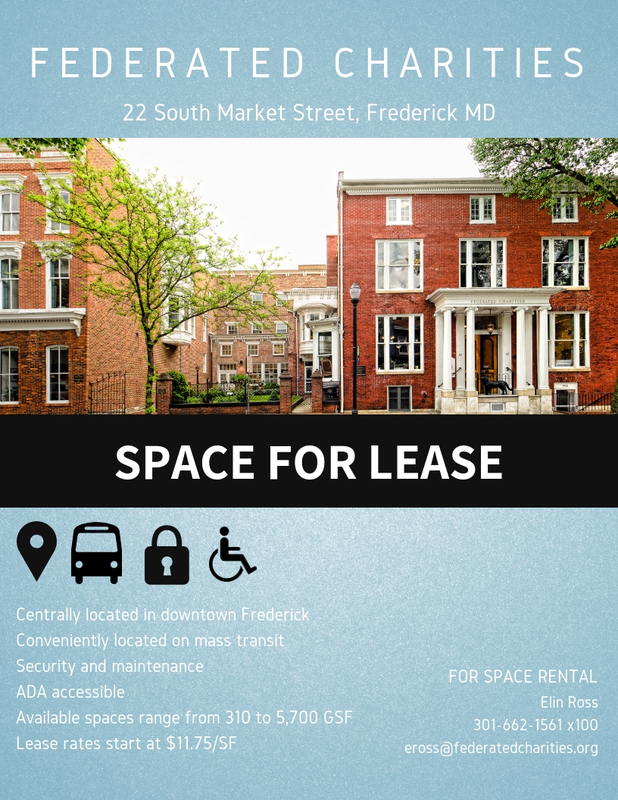 Amenities include: central location in downtown Frederick, near mass transit routes; security and maintenance; ADA accessibility; outdoor/green space; co-work/hot desks; IT and video and teleconference capacity. If you would like to schedule a showing of any of our unique rental spaces, please contact us at 301-662-1561. Click here to download a rental brochure.